Fish Dynamics is a hands-on biology unit for multiple grade levels that explores the structure of experimental design over five class periods using live zebrafish embryos. A Fish Dynamics student graphing her experimental data. As in our Project BioEYES unit on heredity and genetics, students will use zebrafish to explore experimental design. Zebrafish are a model organism used by over 1,000 research labs around the world. They have been used to study stem cells, cell regeneration, metabolism, and cancer. Their simple biology and ability to reproduce quickly, combined with the fact that zebrafish share 70% of their genes with humans, makes them an ideal model to study. 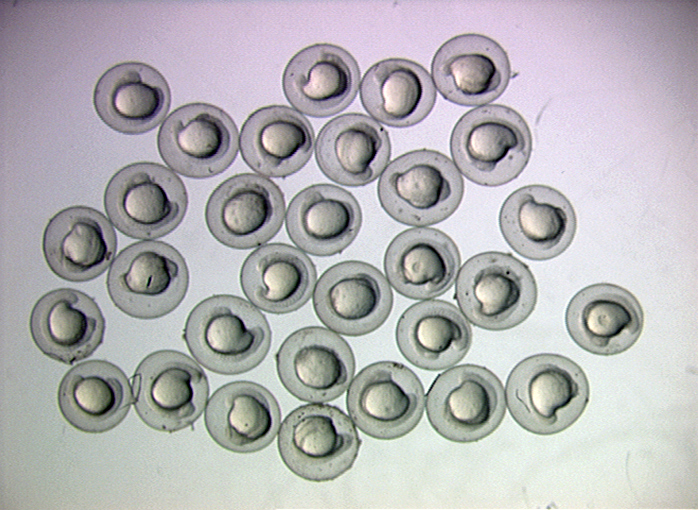 Zebrafish embryos approximately 16 hours post-fertilization. Students will be introduced to a hypothetical situation where scientists have noticed zebrafish embryos developing at different rates, possibly due to varying temperatures. Students will be provided different types of equipment (e.g., Petri dishes, infrared thermometers, heating pads, and thermostats) and asked to explore the function of each. They will then start to figure out how each piece of equipment can be used to either provide for the needs of zebrafish embryos, manipulate the temperature of the environment, or measure a variable in embryo development. Finally, the class will design an authentic experiment to test the effect of temperature on the development of zebrafish embryos. Designing this experiment includes: creating three hypotheses for each of three temperatures, identifying dependent variables related to development that can be measured, and creating a protocol to set up and collect data generated by the experiment. This strategy gives ownership of the experiment to the students, while also engaging them through hands-on inquiry with equipment. It combines their knowledge about living organisms with experimental manipulation. Students collect data and record observations each day of the program. Zebrafish embryos will be provided to student groups. They will place embryos in Petri dishes for each experimental temperature, and take a time-zero data point. Using microscopes, they will continue to make observations of their embryos and record the data in their journals. Students will then construct a bar graph to represent the day's data. 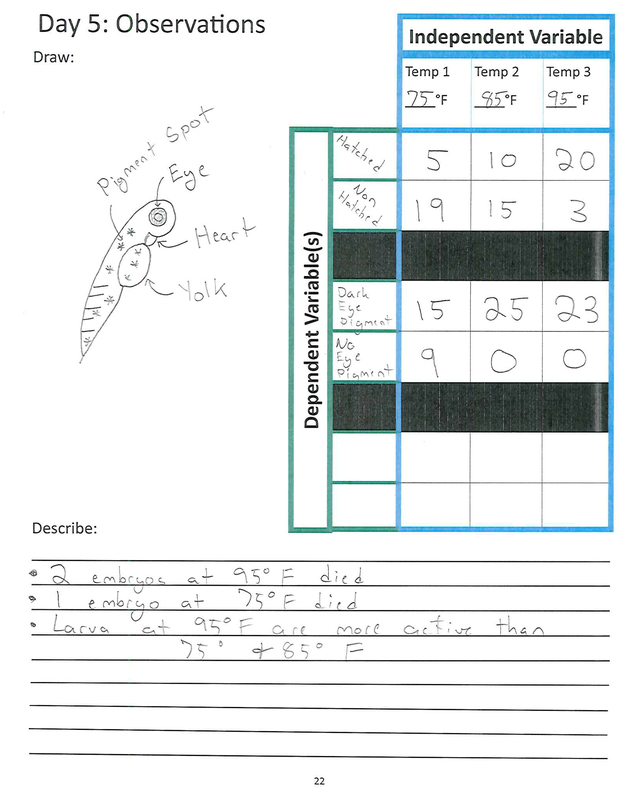 Students are asked to continue data collection, make observations, and constructing bar graphs for each day's data. They will also explore temperature and how thermometers work, how different animals regulate their body temperature, and the connections between biomes and environmental climate. 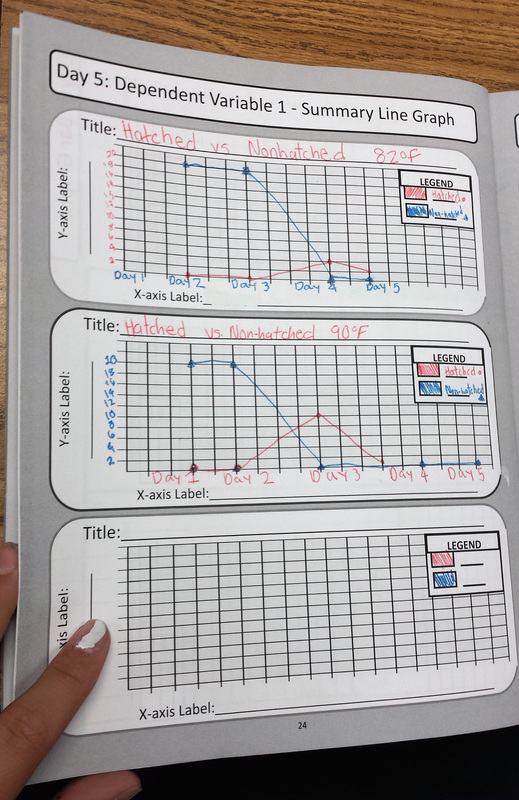 A student's summary line graph, showing how many experimental embryos were hatched or unhatched each day of the program for the experimental temperatues. The students will collect their final set of data and finish their observations. They will then construct line graphs to represent their week's worth of data and analyze their results. Students will be asked to summarize their results, validate or invalidate their original hypotheses, and provide evidence for their conclusions. They will also apply their results to the world at large by using their data to hypothesize about the effects of climate change on living organisms.